Filner Wins – DeMaio Concedes ! It’s official! 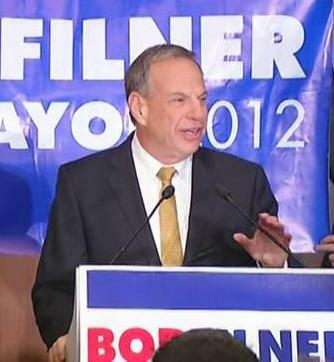 Bob Filner has won the mayor’s seat in San Diego. Carl DeMaio has conceded, local media report. The Registrar of Voters has reported the result, with 100 percent of precincts reporting. The Congressman, the former City Councilman and former School Board member, U.S. Rep. Bob Filner has come out on top after a grueling mayoral race that began with four major candidates at the beginning of this year. Filner has 51 percent and DeMaio had 49 percent of votes. There are still more than 475,000 absentee and provisional ballots that need to be counted. The San Diego County Registrar said the final tally will be cmpleted Thursday by 5 p.m.
Mayor Jerry Sanders congratulated Filner on his victory shortly after DeMaio conceded. Filner said he will be an activist for San Diego communities, particularly those that have been neglected over the years. At about 11:15 p.m. Tuesday, DeMaio addressed supporters, even though results at that time were still uncertain. He thanked supporters and gave special mention to his sister and his partner, Jonathan Hale. DeMaio would have been the first openly gay mayor of a major city if elected. He also stressed the importance of abandoning political labels and working together as a city. Shortly after, Filner also appeared before his supporters. He asked for positive thoughts, but said he still felt confident that the later votes would come in to his favor. He also harkened back to the promise made throughout his campaign that he would shift the power in City Hall to those who have been underrepresented in past administrations. Congratulations Mayor Filner – looking for the tally – it’s almost noon – County ROV website was last updated 2:24 am – what’s up with the count? The Peters/Bilbray race is a cliff hanger. god for Congressman Scott Peters. At last the poor and Homeless in San Diego will get Justice and dignity. All Bob needs to Reappropriate the annual $200 million in former Redevelopment Agency (RDA) Tax Increment (TI) is the approval of Governor Jerry Brown, State Controller John Chiang, State Attorney General Kamala Harris (who all endorsed Mayor Bob Filner), and the Department of Finance (DOF). There is also $100 of million in former RDA assets and cash being horded by the new Civic San Diego in their Reserve Trust Fund Accounts. Bob Filner is having a Press Conference at 4 pm today at Trolley Barn Park on Adams Avenue in Univeristy Heights. A Democratic Mayor and a majority Democratic City Council. I’d say progressives have won in San Diego and the San Diego Free Press definitely had a part in it. Let’s keep it up ! Congratulations to the new Mayor of San Diego Bob Filner!! !